Walking (very fast) across a pedestrian crossing on an enormous roundabout, pulling all my luggage and dodging a never-ending stream of traffic was my introduction to the crazy place of Ho Chi Minh City. Loud, beeping, motorbikes whizzed past my ears, the cacophony of big city noise and smog dazzled my brain after a 14 hour transit. All of this was happening as I was still on that crossing! Within minutes, I understood the most important thing about this city. Pedestrian crossings are just a waste of paint and road rules are completely and utterly optional. With a population of around 8.4m, they simply don’t have time to wait for everyone to freely cross the road. It’s an all in type of situation where only the fiercest survive! Tip – Enter the road as though you mean it. Look positive, make eye contact with those heading towards you and keep your line. Keep moving forward. If you hesitate, even for a second, it makes you unpredictable and improves the chances of you being hit (or at least frightened). Tip – If you are travelling with someone larger than you (like my six-foot husband), put them on the outside for extra protection! In 1976, the name of the city was changed from Saigon to Ho Chi Minh City. It was not a popular change, and in a continuing act of defiance that has lasted decades, the city is still widely referred to as Saigon. Personally, I struggle to call it Ho Chi Minh City, such is the influence the former name retains in both the culture, minds and visual representation in the city. And besides, it’s so much easier to say Saigon! Booking flights and other travel require you to use Ho Chi Minh City, but for everything else, just do what the locals do and refer to it as Saigon. It’s true. At first I thought it was just one man and his quest to get the better of his wayward head covering. However, as I observed on many occasions, this has become quite a serious sport. In small towns, in gatherings on the side of the road, even in the markets, men and women come together to inspect their crowning glories and to take immediate action on any offending intruders. When I was doing some preliminary research on this city, I read so much about the scams. 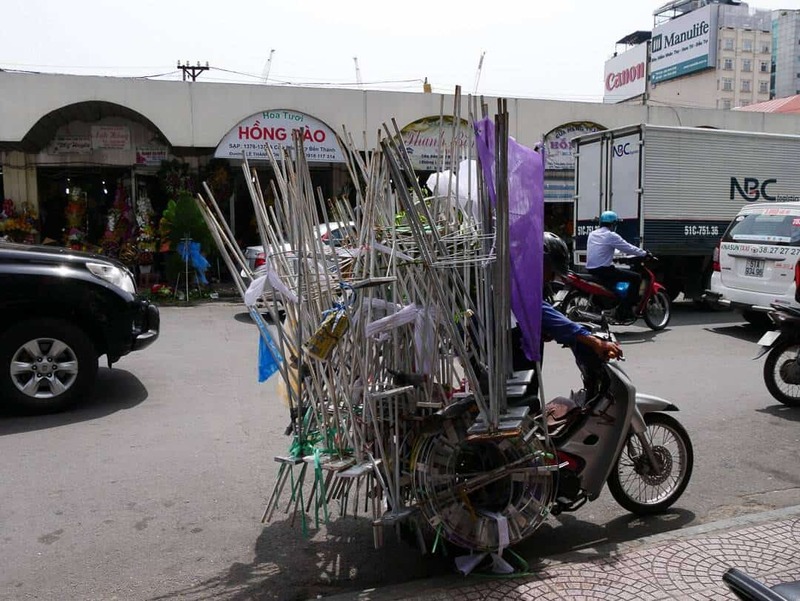 One person even wrote an entire article referring to scams in Vietnam as a national sport. I think this could, and would, put many people on edge. When travelling overseas, there are always local scams and practices to watch out for. We all know about such things as the gold rings in Paris, the spills on your clothing, the gypsy children and fake police officers. It’s worthy of a quick search online so that you are across the possible concerns and can be prepared for them. By and large, the Vietnamese are wonderful people and apart from being questioned constantly by groups of men about where I was going, or offering me a ride on a motorbike there was no other cause for concern. 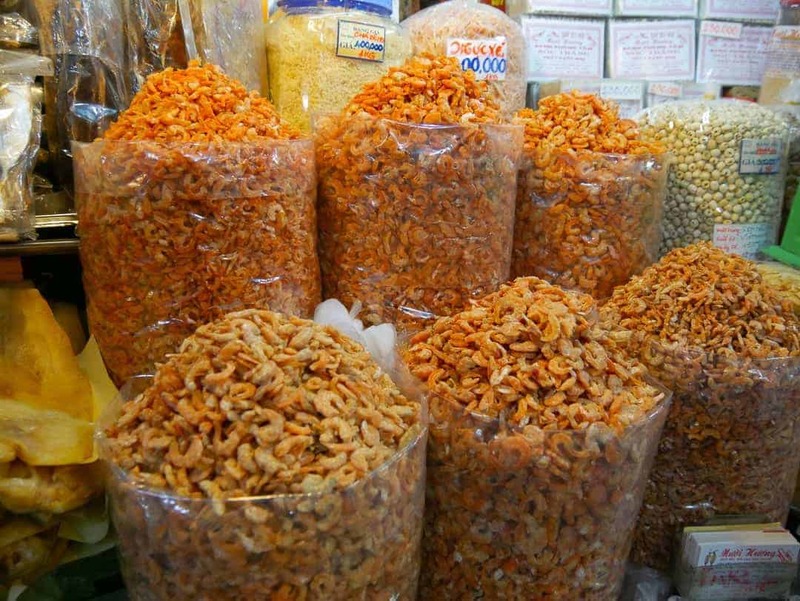 There are however, several things to watch out for in Ho Chi Minh City. The same can be applied all over Vietnam, especially the larger cities. Unsurprisingly, taxis are at the top of the list for a potential rip-off situation. As a general rule, use the Vinasun or Mailinh taxis. Tip: These taxis have meters installed and should automatically use them, but it’s always good practice to tell them you want it on when you hail them. Taxis in Vietnam are inexpensive to use and it’s best to have cash on hand for the fare. Accommodation switching can also occur, more often at the budget end, as the higher end hotels have put many systems in place to try and prevent this. This practice occurs when either your driver takes you to another location citing overbooking, or the check in staff advise they are overbooked when you arrive. You can be taken to another location, not necessarily of the same quality or even in the same area. These people are touts for other businesses, and earn commission for bringing in new business. Tip: Many hotels in the larger cities also have the same names, or ones that are very similar. When booking hotels online always be extremely careful where you are booking. Tip:If you are in a taxi enroute to your accommodation and the driver takes a call then tells you he is taking you somewhere else, don’t let them do it. Instruct them to take you to your original destination. There’s plenty of food here. The Vietnamese love to eat. Like Thailand and no doubt many other parts of Asia, they eat constantly through out the day. The central Ben Thanh Market has plenty of food options, buying ingredients direct from the vendors, or sitting down in amongst the market activity for a bite to eat. Vietnamese food is some of the most delicious in the world, and to many westerners, quite confronting at the same time. We wanted to experience the real Vietnamese cuisine, not the stuff that had been altered for the benefit of tourists. Experiencing local food doesn’t always mean that I eat it, but I love reading the menus and watching others eat without having to wonder if the thing they just ordered was pigs stomach, or chicken intestines. There are many food districts in Ho Chi Minh City. Cô Giang Street sits behind the backpacker area in District 1. 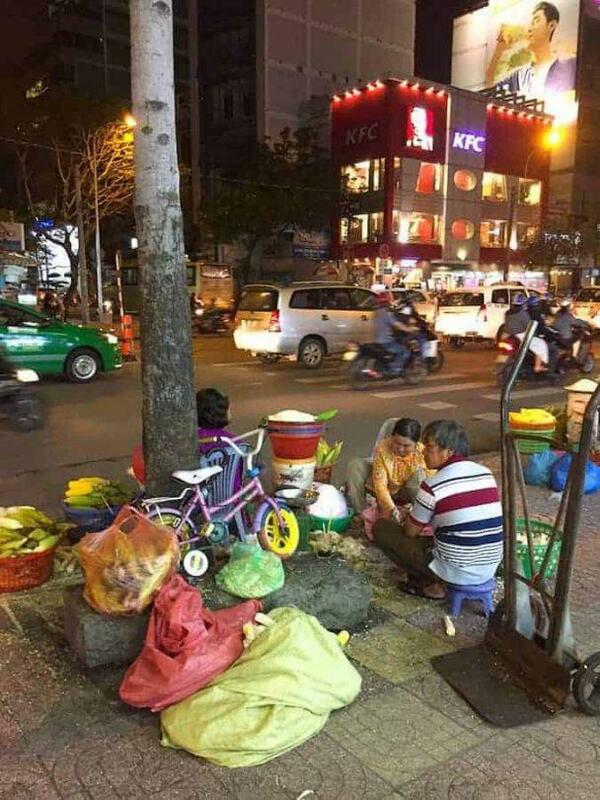 Everything happens on the footpath in Vietnam, and this street was no different. Plastic chairs and tables, with tablecloths that have seen plenty of food pass over them, provide the backdrop. Diners, mostly locals, share plates, clink chopsticks and yell over the top of one another so they can be heard. Tarpaulins provide the necessary roof protection from constant thunderstorms, and low hanging, electrically unsafe light bulbs hang over the kitchens that are set up on the footpath. Woks sizzle, huge pots of stock and water froth and bubble, and entire families work side by side to prepare, cook and deliver the meals. Tip: take an umbrella or rain protection with you everywhere. We went to dinner without any of the above and got caught in a sudden downpour. Two errant drops of rain suddenly turned into a downpour. The street took on a frenzied feel as people came from everywhere to pull down blinds and prop up their tarps. Seeing the look on our faces, an elderly lady gestured at us to sit on one of her chairs whilst we waited for it to stop. Tip: Watch where you put your feet. As I mentioned earlier, everything happens on the footpath. They are places to cook, park you bike, stack your wares, sit and set up your shop. There’s no room for walking! Everyone walks on the road, in amongst the constant flow of traffic. It’s exhilarating and scary all at once. The footpaths and their gutters are also full of rubbish and god knows what else. It only took an instant for me to slip on something gross, in the wet. Apart from thinking I was going to have to call my travel insurer for broken bones, I nearly took out three motorbikes. Luckily, I managed to only knock over a bicycle ! The menu at the restaurant we finally chose was a mix of Vietnamese and broken English, so we did our best with our food choices. This was also despite the waiter cheekily trying to convince us to eat “pigs guts”, as noted on their menu. Not likely my friend. I’ve said before that we love travelling for the learning experience, and to soak up how other people live. Sometimes I love what I see, and other times I can take it or leave it. One behaviour that had me feeling really grossed out was the practice of spitting out food onto the street or footpath, beside where they are sitting. On night one in Ho Chi Minh city, I had the (dis)pleasure of sitting beside a lady, who sat cross legged on her chair, slurping and sucking on chicken bones, then, with the gusto of a male bodybuilder, spat them out with force, onto the area in between her and myself. As the evening went on, the spitting got more frequent and louder, and the pile of crap around me grew. Whilst not everyone seems to do this, it’s a definite habit as I saw more than enough people, of all ages, genders and status, spitting remnants of food onto the ground. In hindsight, it was probably a chicken bone I slipped on! Without knowing the history of Vietnamese occupation and rule, it might seem odd to think there was French influence here. Whilst it might be waning, there are still very obvious signs of the links to their imperialist past. The French Quarter is a more up market and modern part of the city, boasting beautiful French architecture. Some of the most iconic buildings, with interesting pasts, can be found here, along with many swanky hotels and high end fashion stores. 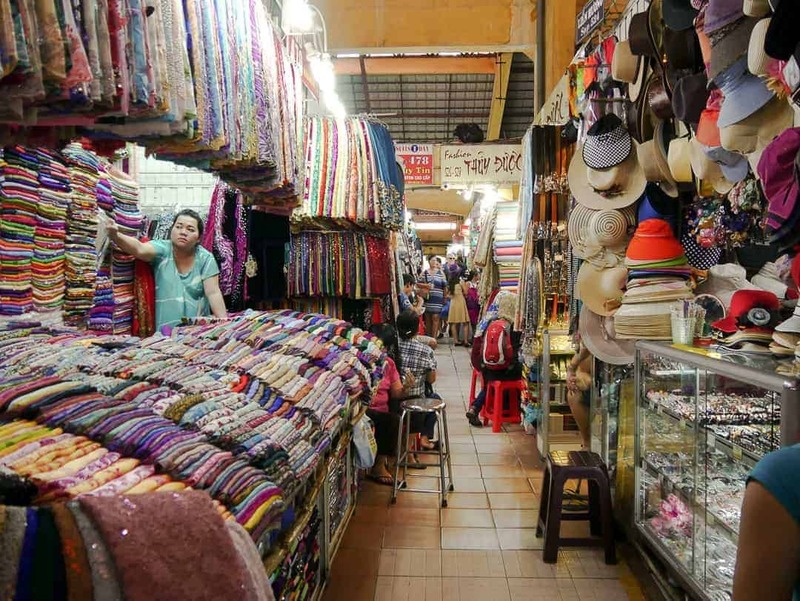 The Ben Thanh Market, right in the centre of District 1, is a blend of wholesale food, eating establishments, and a range of products such as coffee, trinkets and clothing to draw in the tourist. The mass produced scarves, shoes, handbags and the like no longer hold any appeal for me. I gravitate towards the food. However, if you are looking for some bargain t-shirts, flip flops, hats and handbags, this is your place. The streets are alive with market vendors, who find any opportunity to set up shop to make a living. We’ve always known some of the history of the Vietnam War, given its place in modern history and our Australian connection. Still, there is so much imperialist history that pre-dates the war of the 60’s and 70’s. 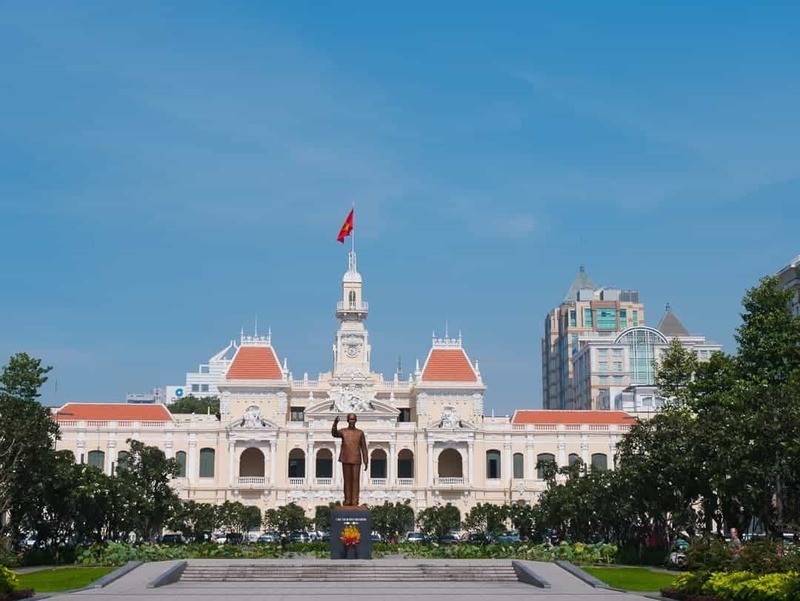 The history of the country can be seen visually presented in the various museums, including the Independence Palace, War Remnants Museum and the Ho Chi Minh Mausoleum. It can also be seen in the mish-mash of French and Vietnamese buildings, the language, and the memories of the locals. One of the best things you can do, and it doesn’t cost you a thing is to get lost in the streets and people watch. On every corner, in every alleyway, on the roads, up high and on the ground, there is always some kind of activity taking place. Ho Chi Minh City is easily covered by foot, but if distances (or the heat) get the better of you, the public bus system is easy to use and very cheap. Whilst the river systems in Vietnam aren’t the cleanest, we don’t travel for just the beautiful stuff. There are some nice areas to sit and watch the world go by down here. It’s also the location for many of the river cruises. If you are visiting Ho Chi Minh City, make the time if you can to visit the Cu Chi Tunnels. Two different areas are available for visiting, with my preference being the ones the locals prefer at Ben Duoc. Keeping the whole experience even more authentic, we caught the local bus there and back. You can read more about these tunnels and how to get there in these articles. Our visit to the Mekong Delta was incredible and I would have hated to miss it. Since publishing several articles on our visit here, I have had so many people write to me and say they wished they hadn’t missed this part of the country when they were in Ho Chi Minh City. Unless Vietnam is a location you visit regularly, it is unlikely that you would do a separate trip just for the Mekong. So, I can’t recommend strongly enough, if you are in the south, try and include this in your itinerary. You won’t be disappointed. If you are looking for more information on the Mekong, you might like these. The Silverland Central Hotel and Spa is a great example of a three-star hotel that is very good value for money. From a service perspective, we were treated more like four-star. We used this hotel as our base in Ho Chi Minh City, coming and going on two separate occasions, as we took overnight trips out of the city. On both occasions, we were upgraded to a larger room, with windows that open. I mention this because they have what I would call an ultra-budget room. A small room tucked away off the hallways with no window. If cheap is what you are after, this would be the only reason to book it, unless you have a desire to feel really contained! Accommodation is very reasonably priced in Ho Chi Minh City. There is the usual backpacker district offering rooms at hostels for as little as AUD$5-10 per night. At the other end of the spectrum, a stay at many of thefive-starr hotels can be anywhere between AUD$150-$300 per night. The Silverland Central offers great rooms around the AUD$100-120 per night. This includes full access to the breakfast buffet each morning. Tip: If you are using a hotel as a base whilst you go off and do other trips, they will hold your luggage for you in secure storage. When we left the city to go to the Mekong Delta, we simply downsized our luggage, leaving the larger suitcases in the hotel. There are also many hostels in Ho Chi Minh City. Buses, taxis and private transfers are the usual suite of options for getting from the airport to your final destination. Catching taxis can always be a bit tricky when first arriving into a new city, and stories abound about taxi scams in Vietnam. I could have booked a hotel transfer but I really wanted to try the new(ish) bus service that commenced earlier in the year. The bright yellow buses of route 109 sit directly outside the arrivals area of the Tan Son Nhat International Airport. A small booth, usually full of locals eating their pho, operates to take your cash. 20,000 VND (about AUD$1.20) will get you all the way to the end of the line. It’s an absolute bargain. The buses are fully airconditioned, have plenty of space for luggage, are efficient, and have free wifi. There’s no extra charge for luggage either, and if you need to get off before the end of the line you just let the guys on the bus know. Buses depart every 15 to 20 minutes and take roughly 50 minutes to get to the Park 23/9 bus station, located near the backpacker district. We got off one stop before at the Ben Thanh Bus Station, then it’s just the quick (but hair raising) walk across to the hotel. There’s plenty! 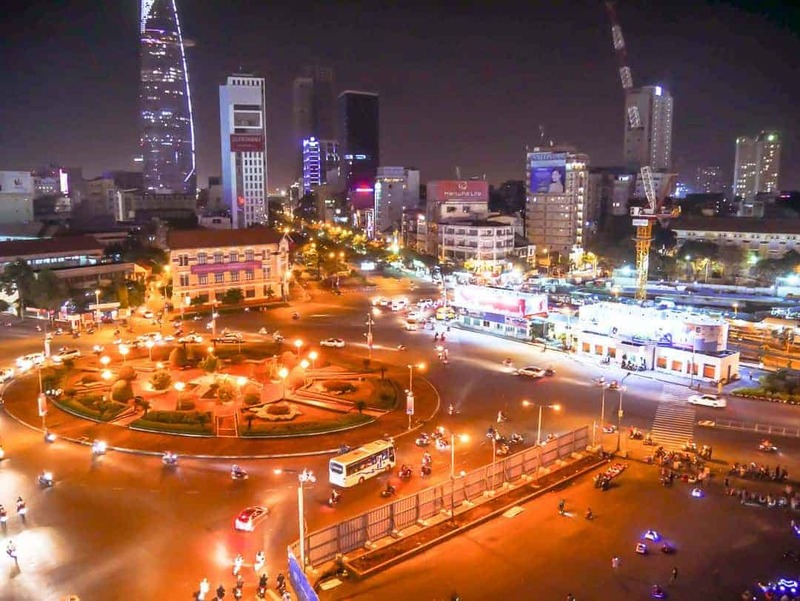 Ho Chi Minh City is the largest city in Vietnam, and one that is progressively becoming more modernised, with many new buildings and transport infrastructure jobs underway. Modern looking bars and restaurants are popping up in between the more traditional ones and younger people are creating a hip new vibe. These are just some of the things to do in Ho Chi Minh City in three days, but like any big city, there’s always more lying in wait for you to uncover. There’s a wealth of other resources on this fabulous city. Click on the images for more information. WOW! This sunrise is amazing!! And the tunnels also seems to be awesome. Ho Chi Minh sounds so good in your blog… you have erased the fear of scams. And the grey hair trivia is so funny, I actually want to see them discussing on this. Loved the pics of local market, so colorful. Thanks Indrani, it’s a weird custom. 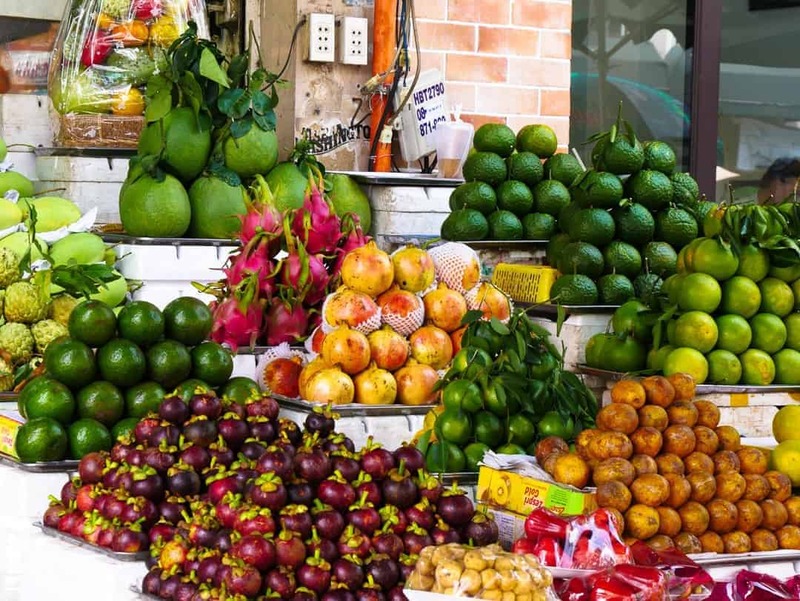 A great post and introduction to Ho Chi Minh City, sounds really interesting and colourful.Food sounds good too although we may try to avoid the bone spitting. That part was truly disgusting! So much great information–thanks for sharing! We are thinking about planing a trip to Vietnam soon, and this is really helpful. Glad to hear you didn’t run into a ton of scams–I keep reading that so it’s nice to hear another perspective. The Mekong Delta looks like an amazing spot to add onto a visit to Saigon as well. Such a pretty sunset photo! Thanks Jenna, yes I think it helps to know that it’s not always bad out there:) Hope you get to Vietnam. It’s an amazing place. I LOVE this ‘Tip – If you are travelling with someone larger than you (like my six foot husband), put them on the outside for extra protection!’ – my boyfriend is 6,5 so like your husband, perfect for protection 🙂 As you describe, food is all over the place in countries like Vietnam and Thailand. 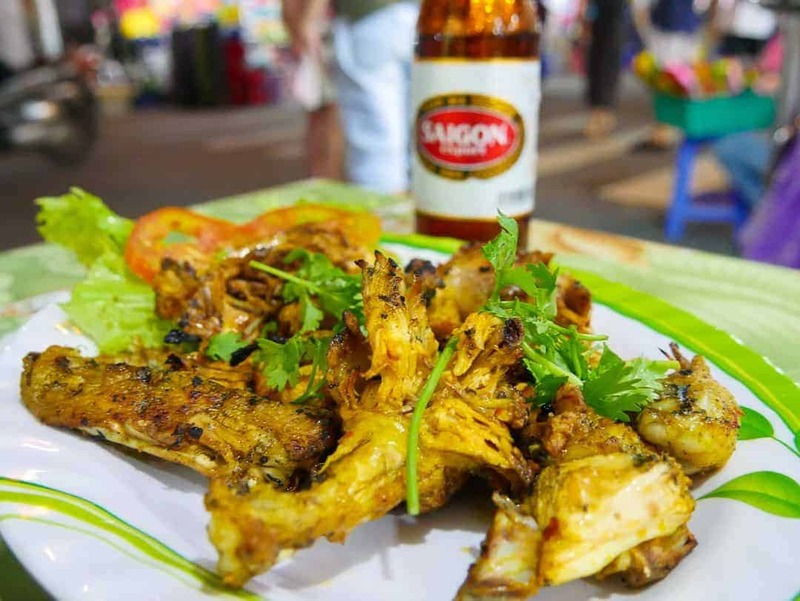 What was your favourite dish in Saigon? And did you see people eating French baguettes? I remember that in Laos I could order baguettes/. They’ve got to be put to use, right 🙂 I really loved one of the really basic chicken dishes I had at a street market. Nothing fancy, but just really tasty. I actually didn’t eat pho in Saigon as I was saving it up for Hanoi. Not as much french food in the open as I thought there would be and really only saw the baguettes when they were being made into banh mi. I’ve actually just been to Vietnam a week ago! But I was only able to visit Hanoi and Halong Bay. Surely, I need to see Ho Chi Minh next time too. It looks like such an amazing place! I can also definitely see the differences between Hanoi and this one. It’s really interesting! Thanks for detailed guide to Saigon! I just visited it shortly and did not even got time to see all sights you described. I agree that the food is great. Well and about the scamps: it’s an unfortunate problem in Vietnam. Having accommodation switched to something completely different is never a good sign. Great information and tips. I thought the hotels in Vietnam should be as cheap as Bangkok but apparently they are more expensive . Ho Chi Minh city comes alive on your post. What is really delightful is that you have captured a slice of life in the city with your lens and frozen those moments in time. The post gives a perspective of the city that goes much beyond the tourist angle. Would love to visit Ho Chi Minh city, which comes across as a throbbing and vin=brant city. I love the tiny observations you made while in Ho Chi Minh and your photos have perfect captured the charm of the city. Thanks for sharing!